Humans exhibit a rich set of manipulation strategies that may be desirable to mimic in humanoid robots. This study investigates preparatory object rotation as a manipulation strategy for grasping objects from different presented orientations. First, we examine how humans use preparatory rotation as a grasping strategy for lifting heavy objects with handles. We used motion capture to record human manipulation examples of 10 participants grasping objects under different task constraints. When sliding contact of the object on the surface was permitted, participants used preparatory rotation to first adjust the object handle to a desired orientation before grasping to lift the object from the surface. Analysis of the human examples suggests that humans may use preparatory object rotation in order to reuse a particular type of grasp in a specific capture region or to decrease the joint torques required to maintain the lifting pose. Second, we designed a preparatory rotation strategy for an anthropomorphic robot manipulator as a method of extending the capture region of a specific grasp prototype. The strategy was implemented as a sequence of two open-loop actions mimicking the human motion: a preparatory rotation action followed by a grasping action. The grasping action alone can only successfully lift the object from a 45-degree region of initial orientations (4 of 24 tested conditions). Our empirical evaluation of the robot preparatory rotation shows that even using a simple open-loop rotation action enables the reuse of the grasping action for a 360-degree capture region of initial object orientations (24 of 24 tested conditions). Lillian Y. Chang, Garth J. Zeglin, Nancy S. Pollard (2008). 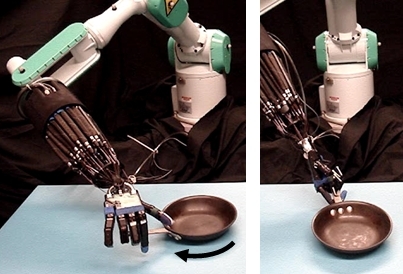 Preparatory Object Rotation as a Human-Inspired Grasping Strategy. IEEE-RAS International Conference on Humanoid Robots (Humanoids 2008), 527-534.